3 Sided Cube is an app development company with a focus on building mobile applications and digital software that has the power to change the world. 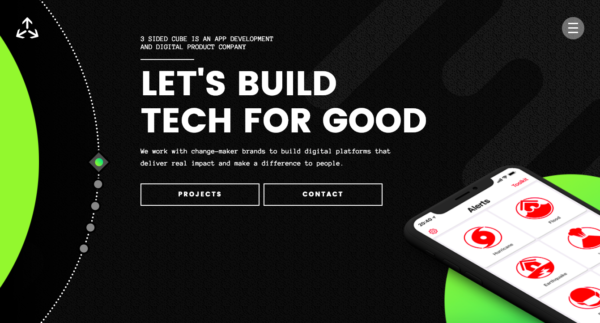 Focussing on tech for good that has social impact has seen the UK based team work with brands and organisations including The Red Cross, Lush, Global Forest Watch and RNLI to make solutions that changes lives and saves lives all around the globe. Their website is an example of unique navigation and use of scrolling that encourages the user to get lost in an infinite wormhole of content. A well thought out user journey allows visitors to digest comprehensive content and navigate a great blog design which makes interaction a joy. Taking pride of place is a portfolio of impressive work which shows the quality and calibre of projects they work on, such as the worlds first blood tracking app and a platform that helped to save millions of lives through natural disaster tracking and alerting.